Your teeth play the most important role in making your smile beautiful. Not only that, they are also key parts of the digestive process and proper speech articulation. Could you imagine a life without them? With dentures at Ria Family Dental you don’t have to live a life without teeth! Dentures are removable dental equipment composed of false teeth attached to a plastic called acrylic, or metal called cobalt. Modern dentistry and your trusted Ria Family Dental dentist create dentures that closely resemble your natural teeth, so you can smile confidently wherever you go. With dentures, these difficulties are overcome. Your eating will return to normal, although there will be a few restrictions with regard to the food you eat; you can talk more easily; your jawbone receives the normal amount of stimulation to remain healthy; your cheeks stop sagging; and you can smile confidently! No more moments when you have to cover your mouth. Imagine that! There are two main types of dentures, full dentures and partial dentures. Both types serve a similar purpose, but are used in different cases. Full dentures are recommended for those who have few to no teeth left. The upper and lower arches are replaced with dentures, including the soft palate. Partial dentures are for those who still have natural teeth. The dentures are clasped to the teeth for support. Your Ria Family Dental dentist will explain which is best for you. As dental specialists, we at Ria Family Dental work with you to determine the best form of denture treatment. 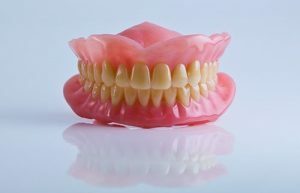 It is important to understand that while dentures are durable, they can still suffer from damage. Thus, they must be cared for properly. Stand over a soft towel or basin of water when removing your dentures. Always keep your dentures moist. Soak them in denture cleanser or in water when not in use. Use a soft-bristled toothbrush to clean your dentures. If you see cracks, refer them to your dentist immediately. Fixing the damage yourself will only make it worse. Nowadays, missing teeth can easily be replaced. Dentures are only one of the multiple restorative dentistry options at Ria Family Dental. Talk to us today!